Women, children and many men have been saying it for years... "Chocolate is good for you!" A report out today states "Chocolate 'can cut blood pressure and help heart". with Easter just a few days away confirms that. 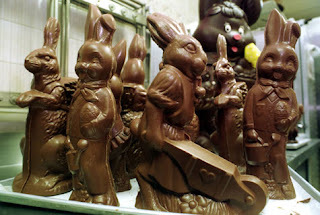 Chocolate eggs are part of celerbrating Easter, the egg cybolizing a new birth, fresh start etc. Easter eggs and other chocolate can be good for you, as long as you eat only small amounts, latest research suggests. The study of over 19,000 people, published in the European Heart Journal, found those who ate half a bar a week had lower blood pressure. They also had a 39% lower risk of heart attacks and strokes. Heart campaigners warned that too much chocolate is damaging because is has a lot of calories and saturated fat. The study looked at the chocolate consumption of middle-aged men and women over eight years. It compared the health of those who ate the most and least chocolate. The study found that those who ate more chocolate cut their risk of heart attacks by around a quarter, and of stroke by nearly half, compared with those who ate the least. But Dr Buijsse warned that it was important people ensured that eating chocolate did not increase their overall intake of calories or reduce their consumption of healthy foods. The researchers believe that flavanols in cocoa may be the reason why chocolate seems to be good for people's blood pressure and heart health. And since there is more cocoa in dark chocolate, dark chocolate may have a greater effect. I can hear the rustle of wrapping paper already.